With the upcoming Superbowl, many have already started planning their game-day parties. Not me though, because I’m actually going to the Superbowl! It’s being held in my hometown of Indianapolis, so I picked up a one-day catering gig to ensure myself a ticket to one of the biggest sporting events of the year. I love planning sports-themed parties though, so I thought I’d share some recipes that are Indiana specific, and some general ones loved by us Hoosiers. Indiana definitely knows their corn; it’s the fourth largest corn producing state in the US! Grilled sweet corn in the summer is a Hoosier favorite, but we love it in any way we can get it. 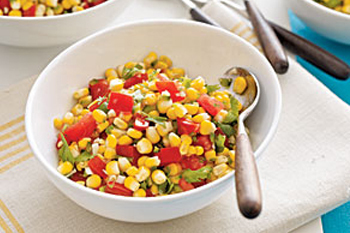 One of my favorites is corn salsa. This is a simple, healthy recipe that can be easily whipped up. Combine all ingredients in a large bowl and mix. Refrigerate until ready to serve. For a tasty spin, roast corn on the cob on the girl and use in place of canned corn. An Indiana specialty, breaded tenderloin sandwiches appear on menu’s all across the state. This is unlike any tenderloin you’ve seen before – these pork sandwiches are thin, crispy, fried goodness. I take mine with mustard and pickles. With a little recipe altering, you can easily make these into delicious finger foods, or keep them as a sandwich if you wish. This recipe is from allrecipes.com and never disappoints! Flatten the pork tenderloin cutlets until they are about ¼ inch thick. If you’re making bites, cut to bite-sized pieces, or desired sandwich sizes if you’re going the traditional route. Beat the eggs and milk together in a shallow bowl, then combine in the garlic and onion powders, season salt, and pepper. Place bread crumbs in a separate shallow bowl next to the egg mixture bowl. Dip each tenderloin piece in the egg mixture, then into the bread crumbs, coating the entire piece, then set aside. In a large skillet, heat the oil until it is simmering, then drop each tenderloin in the oil and fry until golden brown on either side. If you have a fryer, you could use that instead. Drain the pieces on a paper town and let cool, then serve! If you’re doing bites, I suggest mustard or ranch for dipping. Recently, this delicious gem has popped up at nearly every party I’ve attended, and it is absolutely amazing, and pretty easy. I prefer to make it in a crock pot, but there are several other ways you can make it. This recipe is for the crock pot method. Add chicken, hot sauce, softened cream cheese, ranch dressing, wing sauce, and cheese into crock pot and mix well. Heat on low heat until desired temperature, then keep the dip on warm while serving. Are you hosting a Superbowl party this year? 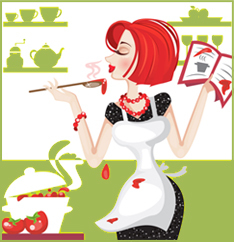 What recipes will you be making?